Wiregrass and Rocky Mountain Church road were both interesting – they felt like there was much less gravel than last year, but quite a bit more washboard. A couple dogs on the rollers, easily scared away just by looking at them with the helmet light. The only really exciting thing through this section was a MASSIVE bonfire party in Hollins Wildlife Management area. I’d guesstimate about 30 teenagers and young adults had built a HUGE bonfire in the middle of the intersection where we had to turn left to start the dirt climb that would take us up to Bull’s Gap and the Skyway-1 ridge line. They were all having a good time, but I came from nowhere and was already around the bonfire and starting up the hill before I think they noticed I was there. Somebody yelled asking if I was out for a long hike. I was confused because I was clearly riding a mountain bike. But anyway, it was awesome to just stumble upon, into, and through this party at about 1:30 in the morning. The climb went well and the Skyway-1 ridge wasn’t nearly as muddy as I thought it would be. In fact, even with the rain from the day before it was less muddy than when I had ridden through there on the way to Auburn. I was able to ride the whole thing and didn’t have to hike-a-bike through the one bad section a couple weeks early. Everything was somewhat firm and rideable. The forest service has grated the dirt road at least once removing/burying all the triangular shaped rocks that made riding this section so hard (especially downhill). Also, the big ruts were gone … but they would return about 24 hours later when the massive thunderstorms rolled through (see next section). I hadn’t ridden Skyway-2 since the race last year, and it was interesting to find it also mostly (but not completely) rut free. Compared to the old get off your bike if you ended up on the wrong side of a rut, it was way easier to ride. I was happy to make it to Gunterstown/Cemetery Mountain road because I knew I would be hitting 200,000 all-time miles on Strava when I made the left turn. I flew past Gunterstown itself and kept myself warm (still in shorts/short sleeves/no vest) by pushing the pace on the uphills. So many adventures and races on this chip/seal road, so many memories, and so many dogs … actually just a couple and they were sound asleep or at least I somehow snuck past them. I made the right turn onto FS637, which is Alabama’s longest gravel road. It’s a super fun road with so many ups and downs and spurs. 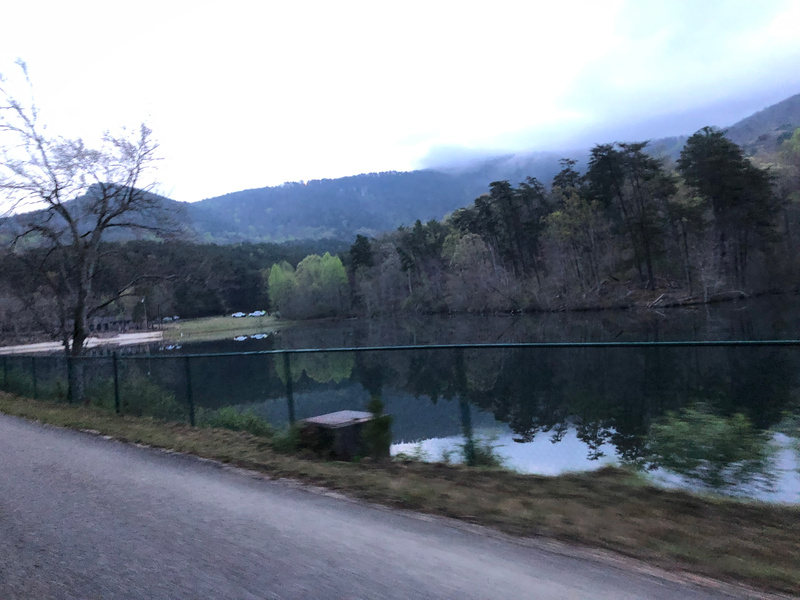 By the time I made it to the Camp Mac Rd, it was just past 4AM and I started to realize that I was going a bit too fast … I would make it to the Cheaha store about 30 minutes before it opened. By the time I made it to Cheaha Lake, 1000 vertical feet below the store, it was plenty light enough to ride without lights. I called Kristine as soon as I made the turn onto AL-281 because this is the spot where you get reliable cellphone reception again all the way to the top of the mountain. That is a tradition for all my adventures out here, I always call Kristine on the mountain because there is cellphone service on both sides … and it is helpful to talk to her to distract myself from the climbs. Plus, I’m a stickler for traditions and doing the same thing over and over again. Earlier on the Kentuck OHV trails, I wasn’t sure whether I should keep plowing ahead or slow down and save energy to hit the store at 7:30 instead of 7. I decided that it was a bad idea to slow down because my heartrate would drop and I would get ridiculously sleepy without the exertion. So I plowed ahead and ended up making it to the Cheaha store at about 6:50AM. The “open” sign was not lit up, but I could see the park ranger car parked out front. Sure enough, there was a park ranger and another worker inside the store and the door was cracked open. I leaned in and asked if I could buy something even though they weren’t open yet, and the worker said “sure, no problem, come on in”. I bought $20 worth of food and gatorade. I have the receipt. I still had some of the original food I bought at this stop when I finished the race 210 miles later. I will detail what I bought at the end of the post. Rejuvenated and pretty cold by this point, I put on all the warm stuff that I didn’t even think I would need but thankfully had brought with me anyway and bombed down the mountain. Quite foggy, no views at all until closer to the end of AL-281 when it was well past sunrise. The fog started to lift but the sun didn’t come out until much later in the day. It stayed overcast until mid afternoon through all of the FS500+ roads and the Coleman Lake horse trails. The horse trails were great, but had been ridden a lot recently and there was quite a bit of fresh horse poop this year. Thankfully I didn’t have an open surgical wound on my foot this year, but I was wondering how quickly you would get sick from poop flung up onto a water bottle. For this reason, I didn’t drink much at all for the hour plus that I was on all the trails. Then afterwards I spit out the top of the bottle just in case and then drank a bunch because I was thirsty. By this point over 125 miles (12 hours) into the race, I had only drank about 60 oz of gatorade and water thanks to the cool temps. horses, i stopped to take this pic and waited until they waved me on – didn’t want to scare the horses. The best part of the race for me was the next stretch of the Piedmont Horse loop which included quite a bit of dirt road riding too. These were super steep, almost entirely rock free, firmly packed (but not hard) dirt that you could just fly down. This was also the place where the tornado had torn through last year before the race. You could see some tree damage, but a lot of it had also been logged (I think) so it wasn’t entirely clear “hey, a tornado went through here”. Plus, it’s Alabama, so everything grows so fast here. There is a section that is tough with some unexpectedly steep trail climbs, but I knew they were coming from last year … and knowing they were coming, and not being surprised at how much distance it was to finally get back to FS500 was huge mentally for me. That was a really tough section last year because I had assumed I would be hitting FS500 any minute … for about 2 hours. 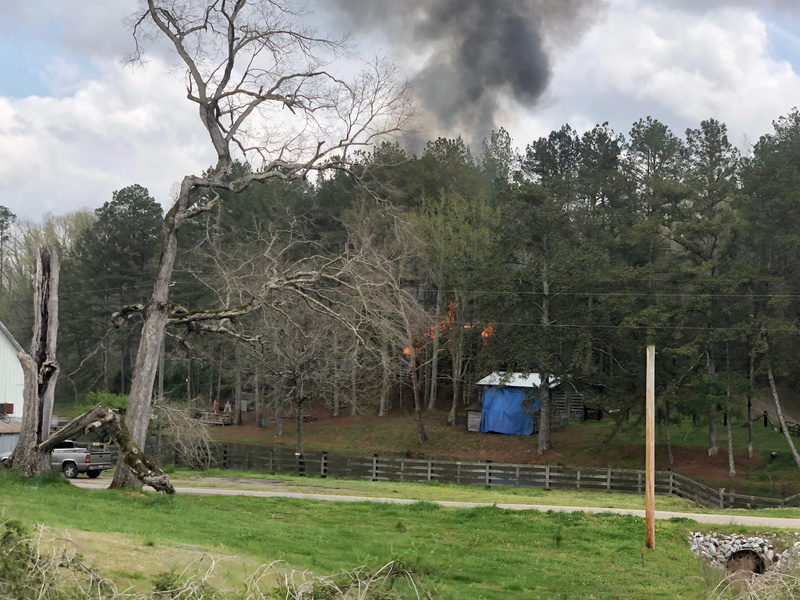 There was a quite fresh, still smouldering controlled burn that we just rode straight through. Lots of trees down from either the burn or a storm. 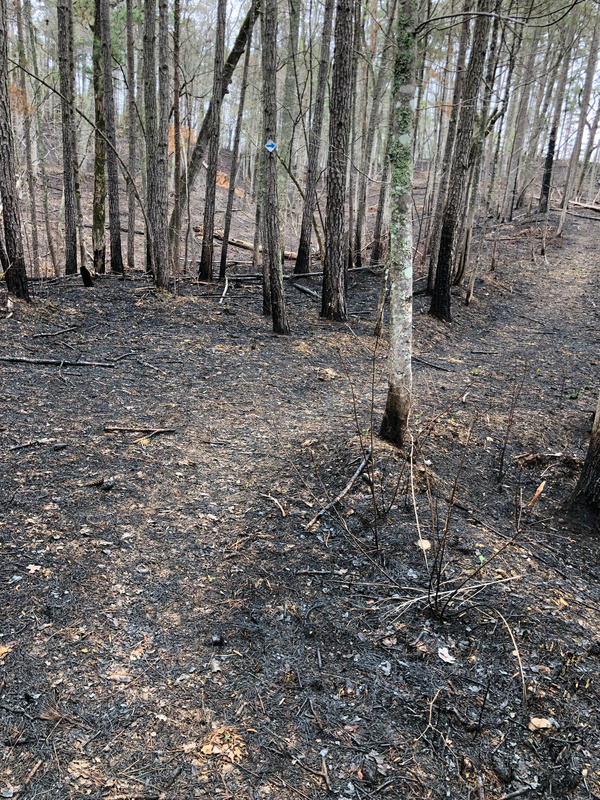 You could just ride through the woods around them though because there was very little vegetation left after the burn. Finally, I popped out on FS500 and started seeing a few other rides. I had seen Brad Hood and Matt Johnson stopped on the Coleman Lake horse trails trying to fix a leaking valve stem. I had also seen several road riders earlier on AL-281. But on FS500, I saw some other bike packers! I was wondering if they had detoured off the Chief Ladiga trail, and turns out they had. One of them had ridden all the way to here from Alaska!!! It’s kind of pitiful how little of Duggar Mountain we climb to get up and over to Piedmont. This mountain is the showcase of the area at over 2000′ tall and nearly 1500′ above the valley making it only slight less vertical lift than Cheaha (about 300′ more on Cheaha). But there just isn’t any reasonable way to get up to the top any more. Still though, the climb up the pass is a Cat 3 climb of about 600′ (meaning there’s still about 900′ to go … so less than half of the whole climb). On the other side of Duggar you drop down on a paved road and enter dog country where many dogs chase you. Thankfully, none of them were mean and most of them you just had to point at and didn’t even have to say anything other than “hey buddy, good doggy” and they will just kinda run alongside you or back to their house. I had been looking forward to McDonald’s for forever and just rode straight there. Two medium iced-coffees that would fit in my cupholders (water bottles refilled with water and moved to side of backpack) plus two sausage egg and cheese mcgriddles and four apple pies to go. After McDonald’s I headed back down to the Chief Ladiga trail intersection I had crossed and turned left on it to head into Georgia. Lots and lots of people out riding as by this point it was a beautiful sunny afternoon about 1pm. I didn’t have any suntan lotion, but thankfully the trail is pretty well shaded. Lots of people riding, one person roller blading, and one tandem. I passed the Chief Ladiga campground and was thankful for the nice uptick in pace on a smooth rails-to-trails. I knew it wouldn’t last long, though, and that there was mud up ahead on Treat Mountain. 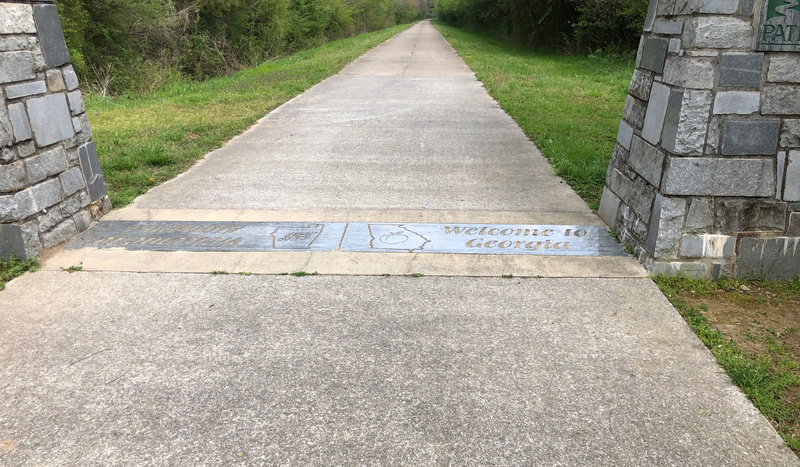 The amazing thing about taking us into Georgia via the Chief Ladiga is that it connects the TNGA (Trans North Georgia) race course to the Skyway Epic race course. TNGA ends at the Alabama border. The skyway crosses over into Georgia a little bit more than halfway through its race intersecting with the TNGA course for a little under a mile. Skyway turns right and heads over to Treat Mountain and a mile or two of mud hole navigation later hitting Alabama Road which is a mudding 4wd road across the top of Treat Mountain and down into Alabama. I had climbed Treat Mountain once before on a road bike and then turned left to ride over to GA 100 before working my way down to Heflin via paved roads. This time I got to basically do the same thing, but on a mountain bike, on unpaved dirt roads with a gazillion feet more climbing – on the “downhill”. You pop out on rabbitown rd right at the base of the steepest of its paved climbs and then head up to what was a new gravel road this year across the original bridge over the creek before Co Rd 49 was built, I’m sure. After this dirt road comes back to 49, you turn right and then left to resume the course from last year. It was nice to hit that portion of the course well before sunset because it was quite confusing in the cold, in the rain, in dark night last year. Perfect this year except for the large gravel that has been recently dumped onto some of the mud puddle sections. Thankfully those were short, and I rode them quite slow not wanting to cut a tire. Having been up for 36 hours straight by this point, I was starting to feel the first sleepiness setting in so I started blasting the Bohemian Rhapsody soundtrack out of my phone mounted on the stem. This helped waken me up and rejuvenated me for all the steep, trackless climbing. I was still hitting them hard standing up for quite a few of them. Little did I know that my knee was about to give out. That happened when I stopped in Heflin. Thankfully instead of 1AM and everything being closed, I made it to Helfin shortly before 7pm. This meant I wouldn’t have to deviate way off the course to make it to the interstate to hit the 24 hour mcdonalds. Instead, I had my option of places to stop really close to the course with minimal backtracking required. I first tried Piggly Wiggly (grocery store) because I was craving a deli sandwich. As soon as I set foot in the store, I saw there was only one cashier and a line of people with full shopping carts waiting to checkout. Forget that, I immediately turned around and rode a block farther south to the Dollar General. I was still hoping for gas station premade deli sandwiches, but they didn’t have any. I settled for spicy sausage (slim jimmish, but some brand I hadn’t heard of). Plus, I still had tons of food left from earlier stops so I really only needed the gatorade. Refilled my bottles and took off. I saved at least 30 minutes not having to ride way down to the interstate and back. I still had 3 of my mini-shots of coffee left and went ahead and downed one of them before leaving the parking lot. I did this partly because I was getting sleepy, but also because I was so ridiculously sleepy on AL-281 last year. I was fully asleep at one point and only just barely woke up as I started to fall last year. I was doing much better this year and the coffee helped. Definitely getting sleepy, but felt more zoned out or zoned into the ride. The problem was my right knee was starting to kill me. I don’t know if I stepped wrong somewhere in the store, or whether it was just all the hard work on the hills finally catching up. But I had a shooting pain if I stood up and pedaled hard for more than a second or two. This was annoying because of saddle sores I would really have liked to ride each of the climbs standing up from bottom to top. There was no way to do that though so I had to switch into super easy gear and spin up them, which was thankfully below pain threshold. I figured I had made it past the window for afternoon thunderstorms and was free and clear for the rest of the race. How laughably wrong I was as a massive thunderstorm complex moved through right as all of us were on various points of the Alabama skyway ridge (100 miles long depending on what you count as part of “the ridge”). It went from being a nice warm mid 60s degree evening to hypothermic cold instantly when that downpour hit accompanied by very strong winds. It was like you were swimming in 50ish degreeF water and then getting out of the water and standing in the strong wind all at once. It was still perfect weather when I left the Cheaha store after resting there in a rocking chair for about 15 minutes. I got a text from my wife about halfway down the descent just before you lose cellphone connection – storms moving in here (in Birmingham), keep an eye on the weather. I know that storm systems move at various rates and a lot of times there is a heavy southwest – northeast tilt to the storms meaning that it could be several hours yet before it made it all the way east to Cheaha and south towards Sylacauga. Just after i saw the text pop up on the phone, I saw lightning off in the distance towards Birmingham. I kept hoping as I rode southwest that I would get below the line of storms. One thing to consider is that in rural national forest areas, there is not a lot of shelter. I guess I sorta realized this because my plan was to try to make it to Chandler Springs church and assess the weather closely there. Well, I had just passed Adams Gap and made it up near the high point on Skyway-3 when I felt the first rain drops, which very quickly turned into a downpour. My change of plans was to try to make it to the Gunterstown / Cemetery Mountain road and hopefully there would be a trailhead kiosk for the Pinhotti. No such luck, a whole lot of nothing at that intersection. I continued across and up the other side but hadn’t gone more than 100m when the lightning got a bit unbearable. I knew I was climbing up to a high point on a high ridge line, so I decided given how cold I was it was time to break out the emergency bivy right there in the pouring rain under a not-too-tall tree. This was my first time using it, so I just unrolled it and climbed in … immediate warmth … my feeling of “sweet, I’m saved” very, very quickly switched to “oh crap, I may need to think about using the sos button” as the lightning was just one right after the other and I started shaking uncontrollably as it had gone from being warm to freezing so fast as the cold water was pooling on top of me. I could feel the cold through the mylar. Then my next thought was, that’s crazy, I can self rescue myself in 15 minutes by riding down the mountain either side and knock on someone’s door in either valley. But then my next thought was, that’s would mean quitting the race. So I decided to give riding one more shot, and that’s where I got lucky. I didn’t know where to put the now completely soaked emergency bivy. I didn’t want to open my backpack which was dry from a waterproof shell. So I noticed the mylar and thought I would try stuffing it inside my jersey. It was still “warm” (i.e., 85 degrees instead of 50 degrees) from me having been inside it and plus it ended up reflecting my body heat as I started riding. The warmth was just enough to keep me pushing through the storm to make it to the first shelter I can find which I knew would be the Chandler Springs church. I made it there after what felt like hours, but was actually only about 45 minutes, and decided to try to rest and wait out the rest of the storm. The front stoop of the church was a sheltered concrete slab so I laid down on the welcome mat and crawled back into the emergency bivy. I didn’t change out of my wet stuff, though, because I wanted to save my dry clothes for when it stopped raining and I started riding again. Being out of the rain in the bivy helped, but it wasn’t as warm as I hoping it would be because by this point I was soaking wet … I was going to take off my clothes and crawl back in when I noticed that it had stopped raining and the lightning seemed farther away. I decided I should go ahead and change into dry clothes and head out again during a break in the storm or hopefully before the next storm hit. No cellphone coverage there so no way to check the weather. I sent kristine several messages using the satellite tracker (Garmin Inreach) when I was out of cell coverage and needed to let her know why I wasn’t moving on the tracker. Worth its weight in gold. I put on my dry bibs and wrapped the emergency bivy around me pulling the bib straps up and over to hold it in place. Put my dry wind vest on next, and then put my wet jersey on last feeling that there was enough “dry-ish” layers between me and the wet jersey. Not sure if that was good decision, but once I started moving and doing the long climb up Skyway-1 towards Horn Mountain I was plenty warm. The problem now wasn’t being cold and wet, but rather dodging the lightning in the next storm that came close enough to soak me again (thankfully my “heating plan” was working) but not so close that I was for sure going to get struck by lightning. Some of the views from the top of nearby storms whenever there was a break in the clouds/fog/rain were incredible. At one point it looked like I was eye level with one of the distant storms that was being lit up revealing a circular ring around the lightning, but I know that was just optical illusion because of distance. Also, the lightning from any one of several storms was so constant that I didn’t need my light for one stretch of the climb. Especially since the cloud cover and fog would carry the light from a lightning bolt in any of the storms all the way above me on the ridge line even though technically the bolts weren’t in the storm above me. At least that’s what I kept telling myself. Skyway-1 is a long section of a high ridge with several “higher” points and mini-valleys high on the ridge line. I was dreading each time I had to go up into one of the higher sections and relieved going back down into one of the mini-valleys (only 200-300 feet lower). It was somewhat tortuous to have this fear of being struck by lightning for almost two hours, which is how long it took me to cross the ridge from AL-77 to AL-148. It didn’t help that I was playing the soundtrack from Bohemian Rhapsody over and over again to keep myself awake … so having it play “Who wants to live forever?” with lightning all around me wasn’t great other than thinking of the irony of getting struck while listening to that song. To be fair, though, it was the first storm a few hours earlier where there was one cloud-to-ground lightning strike nearby. Most of the lightning in these storms seemed to be cloud-to-cloud, but there were definitely cloud-to-ground strikes I could see and hear in the distance whenever there was a break in the fog around me. So it was still disconcerting to be riding up in the clouds (fog) with the lightning. From there until the end took forever and the climbs on the return portion of our outbound route was so hard, especially since my knee was killing me by this point. Nearly everyone had knee problems on the course, and I think that’s a testimony to the steepness of the climbs and trying to get so much weight up those hills. In retrospect, I wish I had ridden a lot of the middle section before Heflin much easier, but I was having fun and flying through there. What did I eat? Drink? Skyway Epic is so perfectly named. It crosses Alabama’s “skyway” … twice! And it is beyond epic. It is HC epic. And that’s when the race is held under perfect conditions. You throw in rain, cold, and/or heat and the epic meter explodes. The skyway is one of Alabama’s most interesting topographical (and probably geological) features – a long curvy ridge line that includes the highest point in the state and some of the remotest wilderness in Alabama. This race was a big part of what kept me sane recovering from being hit by a car going 50mph. As bad as that sounds, my primary injury was a dislocated toe and deep road rash on my foot. Two surgeries later and I was back to riding, albeit unable to bend my toe or put on a shoe. All of that riding was constrained to my mountain bike for a number of reasons, but the fact that this race was coming up helped keep me positive about not being able to ride long distances. Every single ride I was doing was training for this race. The weather forecast was not looking good all week with heavy rain coming in at some point during the race. Initially, it was supposed to be in the morning 7-8 hours after we had started, but they kept on moving the forecast up as the system was moving faster than they expected. By the morning of the race, they still called for rain beginning at 2AM, a couple hours after we started the race. By that afternoon, they had moved the rain up to a couple hours before midnight. Race director Brent wisely delayed our start so that we could get a few extra hours of sleep and the heaviest rain of the system was supposed to be moving in right at midnight. In addition to the storm moving faster than expected, they also dropped the forecasted temperatures quite a bit. I missed that part of the forecast as I was expecting temps to stay in the lower 50s, mid 40s, not dropping all the way down to the low 30s!!! This would impact my race in a number of ways starting about 140 miles in – 15 miles outside of Piedmont. Up until that point, the course was so difficult that even with temps falling into the lower 40s and upper 30s, it was still possible to stay warm given that there was so much shelter from the wind and the course changed direction so frequently that there wasn’t significant windchill. That all changed around Duggar Mountain because the rain picked up as the temperature continued to drop, and there was no more shelter from the strong north wind. I knew I was in trouble when I looked down and saw how red my bare legs had become. At the same time, I noticed my fingers were starting to hurt from the cold. I was already planning out the call I would make to my parents to come pick me up (Kristine was at the last showing of my kids’ school play) or where I would hang out in McDonald’s for hours to wait for either Kristine or Brent to come get me if my parents couldn’t. My only hope was to find warm clothes in Piedmont. I wasn’t sure what I would find, but it all worked out in the end! That was the end of my draft report from 2018F. Here is a copy/paste from what I posted on my Strava ride description from last year’s race, which is what I ended up using as my race report since I never finished the one on this blog! The Skyway Epic was amazing. Epic doesn’t even begin to describe it. I had some phone issues to deal with from the rain so I didn’t get very many pictures, but I kept on thinking over and over probably 100+ different pics I wanted to take to remember a particular spot or moment. Immediately after thinking this, I would tell myself I’ll just make a mental note and blog about it later. I have a pretty good memory, but I’m pretty sure that I had several out-of-memory errors based on the sheer number of things. The wildlife – one rabbit, one deer, one wildcat (maybe a bobcat, the small wild ones), several turkeys, several birds including one very LOUD one at the top of a long climb, and no people. The start – sleeping in the car ahead of the start after seeing my kids play in the school drama – the mayor (Joisah) and the sheep (Analise). The official nonchalant rollout happened at 3:20AM after we had all gathered by the picnic bench area that has so many memories now from the last 7 years of the race. You know a race is epic when it’s measured by wall clock time instead of an official race stopwatch. The course – the opening singletrack rode well despite the rain. The dams were extremely wet, not with mud but with so much water spraying up. The spillway crossing on wiregrass was flowing, but rideable. I kept my boot leg up in the air to keep it from getting wet. 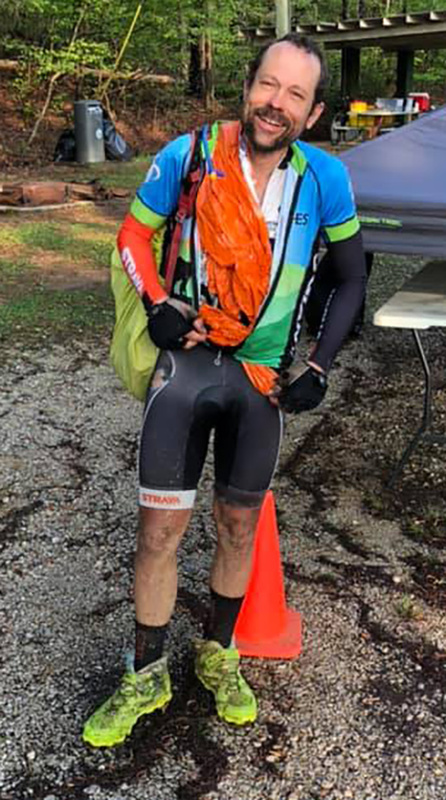 Also, the gallon bag I had taped around it was pretty water proof and stayed on all the way until I hit the pavement at the base of the Cheaha climb 90 miles into the race. This kept the infection risk lower on my foot. I took off the bag, which had developed a few small holes on the bottom, but was still intact and waterproof on the top. I used it later in the race when I got to the next trail section (yellow trail at the horse camp). The horse trails rode really well. Micro-navigation is one of the things I love about mountain biking, probably because you never or rarely have to do it road biking. Micro-navigation is the fancy made-up word I use for “picking a line”. There are many types of places and reasons you have to micro-navigate on this course. The singletrack sections require you to pick good lines so that you can take the corners fast and avoid the bigger roots and sharp rocks. The doubletrack and gravel road descents require a different form of micronavigation based on the terrain, which is very steep. Because the race is so difficult and long, you don’t want to use your brakes AT ALL on any of the descents. You want as much speed as possible to get up the next steep hill, which almost always comes instantly after you cross the bridge or creek at the bottom of the hill. This means picking the right lines so that you are on the banked inside section of the gravel turns. You have to weigh the potential washboarding on the inside lines vs the less banking or even off-chamber on the outside part of the lines. And you have to be able to read and make the decision as you approach the turn with typically one 1 or 2 seconds lead time. The straight, steep climbs on the gravel roads require another form of micronavigation, finding the most firm, least gravel surface with the most traction to get up the hill. This boiled down to the following choices: left side off the road, left tire track, dead center, right tire track, or right-side off the road … or somewhere in between or all of the above or sometimes none of the above on the same hill … hence the need for micro-navigation! The skyway, itself, is an old scenic road that is now impassable except by people with 4×4 offroad vehicles. In fact, there are clubs of 4×4 trucks that use the skyway to test the limits of their trucks. This means that you have to micronavigate large ruts, mud puddles, huge rocks, small rocks, trees alongside the road. The skyway stays surprisingly mud-free as there is usually one side or section of the road this is on solid rock. The trick is that it’s not always the same side so you have to micronavigate to find the right line. Finally, this brings us back to the horse trails. This was a surprising find as you have a lot of singletrack in a remote area of Alabama that I never even knew about. 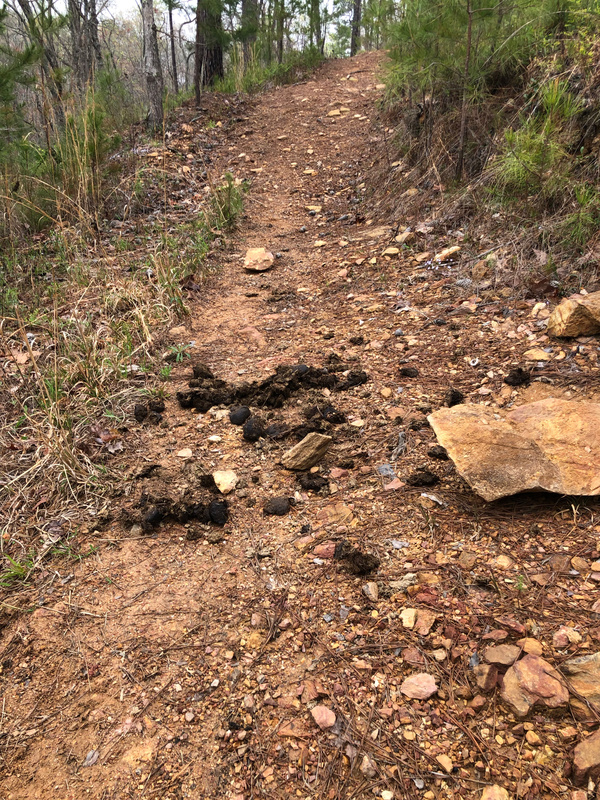 The horse trails rode really well, but introduced one final form of micro-navigation especially with an open wound on my foot – avoiding the horse poop! There wasn’t very much of it, but it was just often enough that you didn’t forget about it so it was easy to see and avoid. 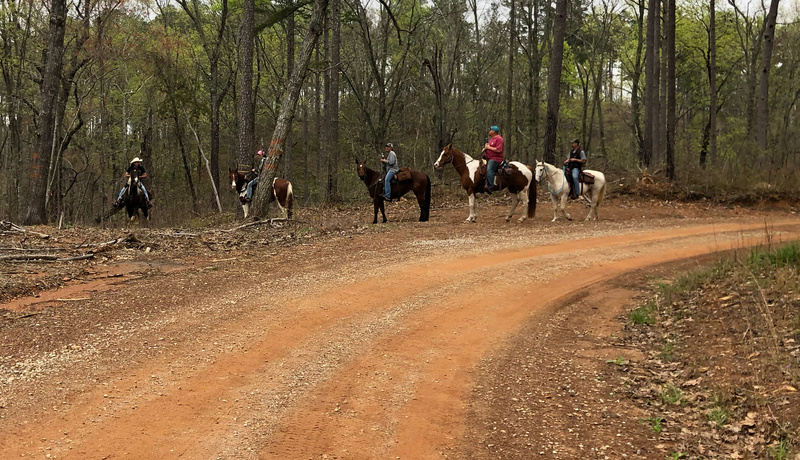 One of the other highlights was through the horse camp area, and it was not just seeing the tornado damage from a couple weeks ago, but riding literally right through the middle of it. The forest service does an amazing job in Alabama and they had cleared not just the forest service roads, but also most of the trails we were on. After the horse trail area, we climbed up and over Duggar Mountain and the very light misty rain that had been periodically happening for the past few hours turned into a heavier (but still light) rain straight into a strong wind blowing from the north. With air temps in the mid 30s by this point, it went from being chilly to downright freezing. 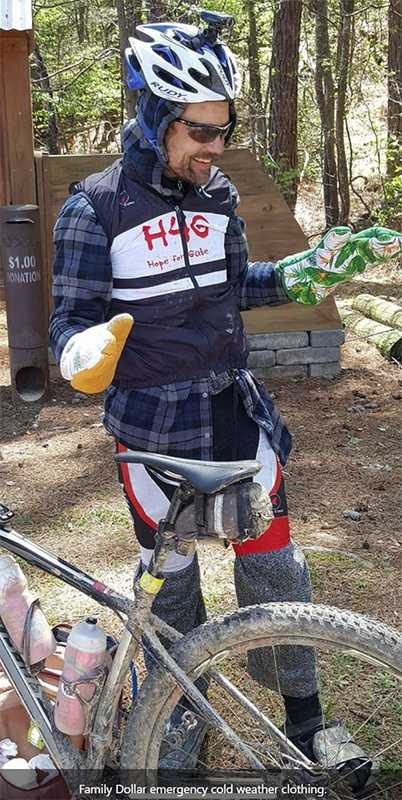 At this point I knew I would have to abandon the race if I couldn’t find warm clothes in Piedmont, 155 miles into the race and only the second place to get food (the first being the Cheaha store at 90 miles in). I found a CVS next to the McDonalds but their clothing selection was very limited. The lady working the check-out counter told me there was a Family Dollar just down the road. I took off to get to the family dollar and found the perfect emergency clothing find – a fleece flannel hoodie on clearance $6.50, fleece sweatpants, thermal socks, and two oven mitts for thermal gloves. I put all this on and as I was leaving the store, the checkout lady said “you may look homeless now, but at least you’re warm!” And she was right, I went from being cold to downright hot even though the temps continued to drop all the way to 30 degF at one point. I had to waste a bit of time either taking the clothes off, or putting them back on. But at least I was warm and not going to have to pull out of the race because of hypothermia!!! I made it all the way to Heflin and refilled water and powerade at the McDonalds. Well, I wanted powerade, but this particular McDs only had tropical punch kool-aide instead. I made a big mistake, though, because I wasn’t the least bit sleepy. I didn’t get anything caffeinated. Seeing as how this would be the last store that would be open until the end of the race (the Cheaha store would be closed because it was 3 in the morning), this was a big mistake. I got extremely sleepy as I started the long slow climbing on the steep hills on AL-281 leading to Cheaha. I couldn’t ride in a straight line and more than once nearly fell off the bike from falling asleep. One time I was fully asleep and only realized it last second because I started to fall which woke me up in time to correct and stay on the bike. The only thing that kept me going was the plan I was working out in my head for sleeping at Cheaha. I had 3 options that I worked up over the nearly two hours it took me to go the 15 miles from the beginning of 281 all the way to Cheaha. The first option was to try to get a room at the Cheaha hotel. I wasn’t sure if there was anyone who would be able to rent the room for me. So, the second option was to sneak into the chapel at the top of the mountain. I assume it would be 24 hour, not locked, and maybe have some benches I could sleep on. But that chapel is at the very top of the mountain instead of 300 feet lower where the store and hotel are located. The last option was to lay down on the cement next to the ice storage container at the store or the vending machine/ice maker at the hotel. I figured it would have heat coming from the equipment that would keep me warm as I just slept for a few minutes. Fortunately/unfortunately the first option worked out as I was able to rent a room – but it cost $90 and it took forever (nearly 20 minutes) for the lady to figure out how to use the system to find out if there was a room available and how to rent it to me as she had only done it once before. Also, if I had just slept on the floor somewhere it probably only would have been 15-30 minutes. Instead, I slept for an hour and a half at the hotel. This made for a much more enjoyable race, but it also meant that my final time was at least an hour slower than it would have been otherwise. Of course, I might have been sleeping involuntarily on the side of the road if I hadn’t stopped at all! I’m really glad, in retrospect, that I stopped because the next morning was cold but stunningly beautiful. If I had continued on, I would have finished nearly the most beautiful parts of the race in the dark. Instead, I got to see all the skyway has to offer in perfect morning sunshine taking me all the way to the finish. Brent and Jacquelyn have done an amazing job with this race year-after-year. Huge thanks!!! I am going to type this up on my blog with maps and data, but I wanted to go ahead and share my finish line photo with all my facebook friends! Also, a huge shout-out and thanks to my beautiful wife Kristine who had a crazy busy weekend with the kids to manage on her own on her birthday! Even though the race covered the entire 24 hours of her birthday, I was able to call her and talk to her numerous times and I owe her a birthday month now!! !